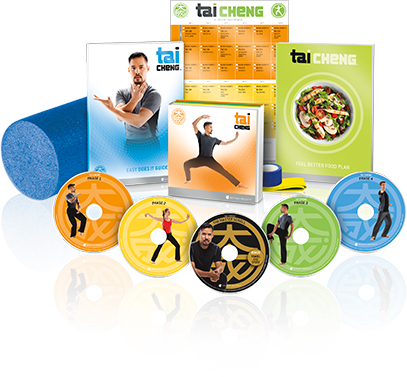 Regain your youthful energy in just 90 days with Tai Cheng. This low-impact program breaks down the 18 fundamental Tai Chi movements that can help strengthen muscles, improve mobility, and reduce the risk of injury, so you can keep enjoying the things in life you love. Workouts and all program materials are English only. Try this program with our 90-Day Money-Back Guarantee. If you&apos;re not satisfied with your results within 90 days, simply call Customer Service for a Return Authorization number to return the program for a full refund of the purchase price, less s&h–no questions asked. Want to rediscover a level of strength and freedom you may not have felt in years? Explore a natural approach that can help restore your body's youthful range of motion and improve balance naturally. Now there's a simple solution, designed to help you take on your daily activities with ease and energy—Tai Cheng! For years, medical experts have recommended the ancient Chinese practice of Tai Chi to improve balance and mobility. With Tai Cheng, Dr. Mark Cheng makes it easy for anyone to master the most fundamental moves of Tai Chi. By retraining your muscles to move the right way and putting your body back into proper alignment, Tai Cheng can help you move better, feel better, and have a stronger, more responsive body. Tai Cheng for Travel BONUS workout—Help reduce pain and stiffness while travelling or anytime you want to feel refreshed fast! Tai Cheng for Sport BONUS workout—Get better at the game of golf or any sport you enjoy. †Transformation took place from January 2014 to September 2015. She used Tai Cheng, Ultimate Reset, and Shakeology. 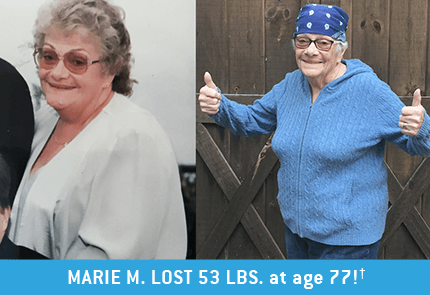 Marie M. is an independent Beachbody Coach. Results vary. *Resistance Band contains natural rubber latex which may cause allergic reactions. Consult your physician before starting this or any exercise program. This program is not meant to replace prescribed physical therapy, surgery, or other medical procedures. 90-Day Money-Back Guarantee includes full refund of purchase price, less s&h. Reviews reflect each customer's personal experience. Your results may vary. © 2019 Beachbody, LLC. All rights reserved.Distributed by Team Beachbody Canada, LP, c/o Beachbody, LLC.